Shipbuilding was an important enterprise in Colonial America and quickly grew into one of the most thriving industries of our young United States. East coast settlements as well as those in Philadelphia and New Hampshire provided protected harbors and bays, small coves and riverbanks, all suitable for construction. Dense forests provided the necessary raw materials. The simple shallops of the Pilgrim era soon diversified into small utility craft for local work and smaller boats for fishing and for transporting people and goods among the colonies. At the turn of the eighteen century, a small sloop typically weighed about 35 tons, but by century’s end, experienced shipbuilders had begun contracting heartier seagoing vessels of up to 200 or more tons. 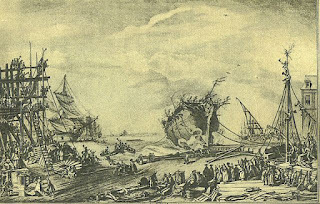 The need for vessels increased and soon every seaport on the Atlantic coast was constructing wooden ships. 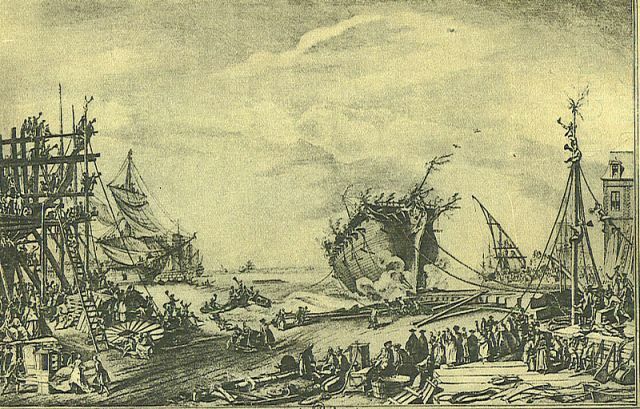 Timber grew scarce in England, and it became cheaper to purchase vessels built in the colonies. Before the American Revolution, about one-third of the British merchant fleet had been built in America. The production of these vessels required the skills of various tradesmen and industries, beginning with the Shipwright who drafted the design and directed the craftsmen in their work. A great number of shipwrights were born with shipbuilding in their blood. From an early age they received hands-on training in the family shipyard, many of these yards having been passed down from generation to generation. Others honed their skills through an apprenticeship. Ship design required a genius for mathematics and geometry with its countless calculations. A shipwright had to assure the ship would float, taking into account the hull’s volume and height. He strove to increase the vessel’s forward motion while carrying a maximum amount of cargo. And he must have a talent for drawing and drafting to create the life-sized patterns the builders would follow. Although it took about 20-30 craftsmen and able-bodied workers to complete a vessel, it was the master shipwright who remained in control. Once plans had been drawn, Sawyers were hired, also known as “saw gangs.” These men were sent to chop down oak and pine timbers to match the drawing’s measurements. They cut the wood to the pattern’s size and seasoned the planks. White pine made for the choicest masts, while yellow pine was best used for decks for its high resin content and resistance to sun and salt. Hackmatack roots were utilized for their naturally crooked growth. They fashioned the angular pieces and gave strength to “knees” which supported deck timbers and braces. One of the oldest tools of ship construction was called an adze. It was a type of axe with a long-shaped blade and bore a slight curve near its handle. 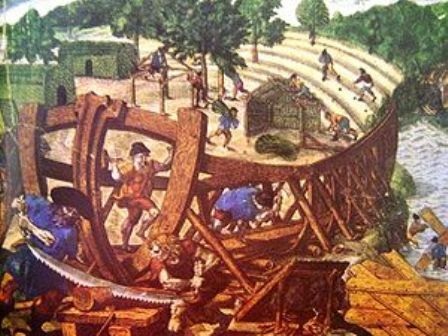 Adzemen were skilled craftsmen employed in shaping and smoothing the timbers of wood. The vessel’s frame was built primarily of oak. Carpenters laid the keel—the vessel’s backbone which consisted of a long, curved beam that ran along the bottom from bow to stern. Joiners scarfed two pieces of wood together to fashion a solid beam the exact length of the keel. The vessel’s ribs were next fastened to the keel, completing the vessel’s framework. The ribs were covered with oak planks, steamed and softened to render them pliable and capable of being curved to assure a form fit. The planks were fastened with wooden pegs called trunnels or tree nails. Borers drilled the holes and Fasteners drove in the trunnels. 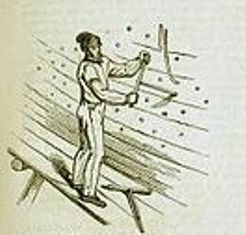 Dubbers smoothed and planed the surfaces, and finally the Caulkers were called to drive oakum between the planks with a flat-edged caulking iron and mallet. Oakum was a pitch substance consisting of tarred hemp fibers. Oakum Boys carried the pails of pitch. The seams and cracks around the trunnels would next be sealed with boiling pine tar to make them watertight. Finally, the hardened surfaces were scraped until smooth. Launchings were grand affairs. Businesses and schools closed for the day so the locals could come out to watch. Standing on the riverbank and supported by a huge cradle, the vessel would be held in place by a set of stocks resembling extremely wide railroad tracks. The owner would speak a few words to the crowd, then the minister would confer a blessing and a sponsor would be chosen to christen the ship by name. The restraints were cut away, the blocks removed, and the vessel inched down the greased stocks into the sea with a great splash. Music played and folks cheered, waving flags and partaking of the refreshments. Once afloat, the vessel would be moored to a fitting dock where she would receive her finishing touches and the complex rigging required to support and control her sails. Additional artisans and tradesmen were hired for this work—windlass-makers, anchor smiths, carvers, sailmakers, blacksmiths, pumpmakers, sparmakers and ropemakers. With the combined the talents of so many laborers contributing to the extensive enterprise of building a wooden ship in colonial times, it is no wonder that launchings were celebrated by the entire town! 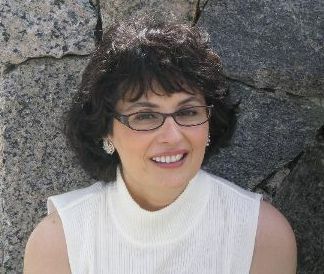 Lisa Norato is the author of Prize of My Heart, an inspirational seafaring historical from Bethany House. A life-long New Englander, Lisa lives in a historic village with homes and churches dating as far back as the eighteenth century. Wonderful article, Lisa! I will show this to my husband, who is a ship builder! Loved reading your book that has so much of these aspects included. One of my friends from SC grew up in a Northeastern shipbuilding family that had been building boats since colonial times. Good morning, Carrie! and thank you for your kindness! Your husband is a shipbuilder? Oh, wow, with all your connections, it's too bad I didn't know you at the time I was writing my book, LOL. Hope the hubby enjoys the article, too! What an interesting article, Lisa. I must admit that I knew nothing at all about building ships - but now I have a bit more knowledge:) Loved your book and I'm anxiously waiting for your next one. Thanks for stopping in, Jen! It's always so nice to hear from you, and I really appreciate your kind words about my book! 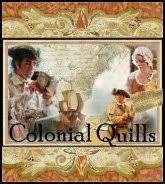 Likewise, I'm anxiously awaiting your next book! Blessings! Thank you, Lisa, for such an interesting post. Shipbuilding has a long history in the Hampton Roads area where Carrie and I live. I remember my grandfather, an Admiral in the Navy, speaking of "the days of iron men and wooden ships". Thanks for reading, Janet! How wonderful that you and Carrie live in such a rich, historical area! I'm sure its the source of a lot of inspiration for you. Thanks for visiting with me, and I hope you have a wonderful day! Hi Joan! I'm glad my article could be helpful to you. Good luck with the new series; it sounds very interesting. Hope you're feeling better! Hi Lisa, great post and very interesting. It would be so fascinating to be present at a launch of one of those majestic ships. Oh, I loved Prize of My Heart, by the way! Hi Debbie. Blessings! Thanks for reading my post and for your kind words about my book. It's so great to know you enjoyed it! And I completely agree; it would have been great to watch a launching. This is wonderful information; and I just plain love the "tall ships" attribution--so stately and grand--gives me chills when I think of them and the part they played in our history! Also of the vital and courageous men that built and sailed them! Thanks so much! Hi Pat! Thank you; I'm so glad you enjoyed the post. I really enjoyed the research while I was writing my story, and there is so much involved in shipbuilding, there's always something new to learn. Have a lovely week, ladies! Hi Debra! I'm so glad you found the post helpful. I pray and believe with you that your novel will soon make it to the bookshelves, because I for one would love to read it!! Sounds like my kinda novel! Blessings and a lovely week to you, too! Hi Lisa! It's so amazing all the materials and different types of skilled labor they needed to make one of these beautiful tall ships! I'm in awe. Thank you for this great article! Hugs..
Hugs, MaryLu, and thank you! I know we are kindred spirits in being awed by wooden ships of old. So glad you enjoyed the article! Lisa, like MaryLu, I am in awe of the knowledge and skill required to build these great ships. I had no idea. And you described it so well! I can only imagine the excitement of a ship launch after the weeks and months of watching it take shape. Such a wonderful post! Thank you. Thank you, Elaine! I think it's a fascinating subject and I'm so glad you enjoyed the post. There is so much involved in shipbuilding; it was hard to condense it to a short article. Blessings! This article really helped me on my project. Thank you so much. This particular post is now bookmarked, as is your blog. I am an authoress of historical-fiction (Savannah of Williamsburg series of novels) and, besides utilizing resources like The Huntington, The Rockefeller Library and CWF, it is always lovely to peruse fellow 18thC. researchers' findings and scholarly posts. Currently, I am introducing a merchant-character whom has acquired his first schooner. Your piece was very helpful :) Thank you! Thank you so much for this great post. 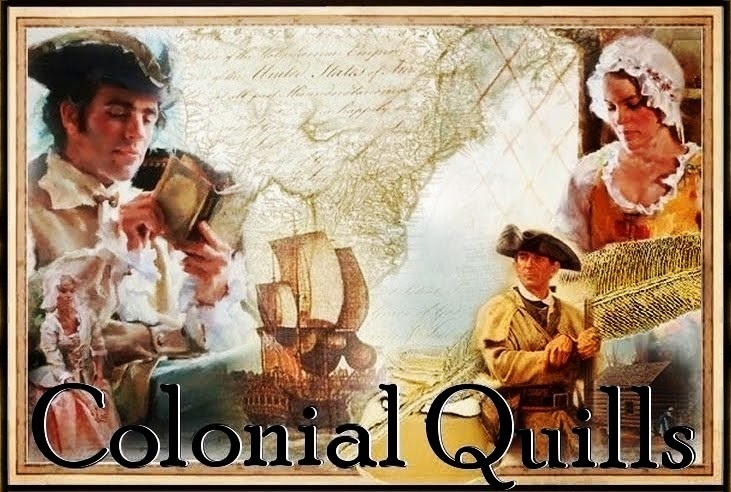 I had an assignment on colonial shipbuilding and this helped me greatly! Nice article . Are you aware of cargo ship building and the use of enslaved Africans to help colonial Europeans in the America ?